The BR9 Hi Power clone comes with two Mec-Gar magazines, the standard for Hi Powers. This clone has a baked on finish, which is well done, or they’re available in stainless. Regular readers know I’m a Hi Power fan. The “Browning” is the original “hi capacity” semi auto pistol. It’s a proven design, popular all over the world, except the U.S. FN/Browning stopped producing the gun in 2017. Finding a good Hi Power has become hard, expensive and something you might not want to customize. But there is hope. The Turkish firm Trabzon Silah Sanayi A.?. – Tisa - is producing the Regent BR9 “Hi Power.” This clone is being imported into the U.S. by LKCI, out of Ohio. And, at about $500, it’s affordable. The Hi Power was a revolutionary, hi-capacity pistol released 1935. John Browning was a major contributor to the design, which is a big plus for any firearm. (He passed before final designing was completed and actual production.) It’s been battle tested all over the world; over ninety nations adopted it for military and law enforcement work. Both Allies and Axis powers carried the Hi Power during WWII. It was my “first,” my own semi auto pistol for carry -- which is funny because that’s what I’m back to carrying again. As noted above, FN/Browning stopped making the Hi Power -- in 2017. (This event was noteworthy enough to be mentioned by Popular Mechanics.) Original Browning Hi Powers, when you can find one, are expensive. “Imported” FN/Brownings Hi Powers are usually beyond abused, requiring complete rebuilds for safety and reliability. Various companies were producing Hi Powers, some with FN/Browning’s blessings, which equaled the FN/Browning pistols in quality. These too are getting expensive. Other companies didn’t bother to get licensed and simply copied the design; some of these models are junk. With the Tisa Regent BR9 you have an affordable Hi Power option for a buying a new “Browning,” and they’re offering a stainless version too. Turkey has become a hotbed of firearms production, including clones and original designs. In 2017 Turkey was number four on the list of countries importing firearms into the U.S., below #1, Austria – Glocks, then Brazil and Germany. I know, we’re always worried about a clone or copy of something that’s being produced in a foreign country, but reports on reliability are good. In fact, the Regent BR9 is being sold by Brownells, which tells you how good it is. Plus, it’s being used by several Hi Power custom shops as a basis for their complete builds. For a full test review of the BR9 – truly a torture test – check out BH Spring Solutions’ website. During this torture test - firing rapidly until it was too hot to function, then dunking it in water to cool and continuing firing – they did discover some weak areas. However, they also offer a BR9 “Essential Reliability” kit. If you plan on doing heavy shooting / training / practice, this kit contains the parts they had trouble with during testing: the extractor, pin and spring, a firing pin retaining plate and heavy firing spring, plus sear pin and lever pin. 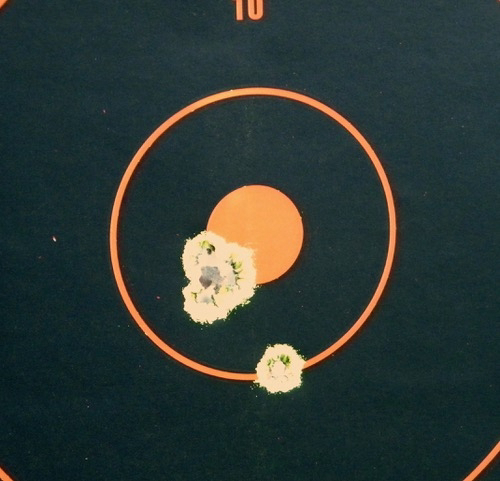 Seven shot slow fire group from seven yards in a standard two-handed stance. Accuracy was good, and there were no malfunctions over about 100 rounds. A friend, also a Hi Power guy, shot it as well and was very impressed, especially considering the price. I was in Scottsboro Gun & Pawn a couple of months ago. Sitting on display was a Hi Power. It felt nice in hand, and the internals looked good. Once they told me the price it was over and done. All Hi Powers need some upgrades for carry, like a different thumb safety – the BR9 has the small original style. Research shows it will accept standard Hi Power and aftermarket parts. As a DIY’er it’s great for me. So, who needs a Regent BR9 clone? For me it’s perfect. I can customize it, learn some new skills, and if I screw it up, I haven’t ruined a classic. Anyone who is familiar with Hi Powers knows it a great platform, and easy to shoot. Having a spare to wear to the range saves wear and tear on your original. 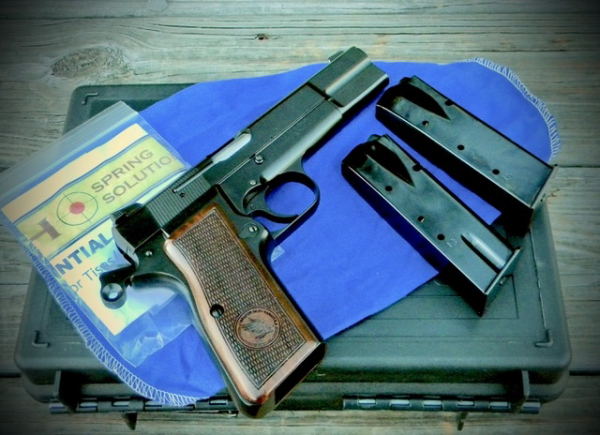 For anyone wanting to experience the classic Hi Power without investing a great sum the BR9 is an ideal platform. To sum it up, anyone who needs a Hi Power should investigate the Regent BR9. Tiger McKee is director of Shootrite Firearms Academy, located in northern Alabama. He is the author of The Book of Two Guns, AR-15 Skills and Drills, featured on GunTalk’s DVD, “Fighting With The 1911 and has regular columns in Gun Digest and American Handgunner.